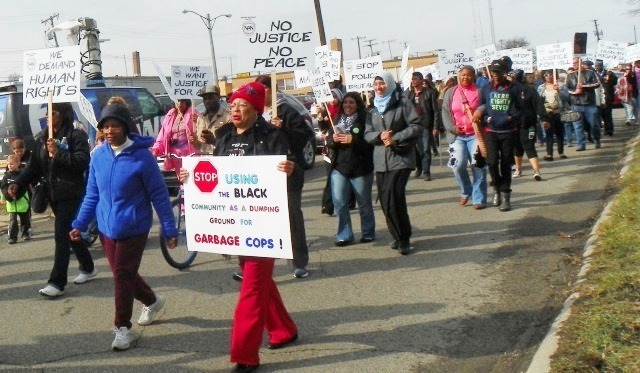 Hundreds marched down route from old Inkster police station, where Floyd Dent was beaten by “Robocop” William Melendez, to new police headquarters on Michigan Avenue April 2, 2015. 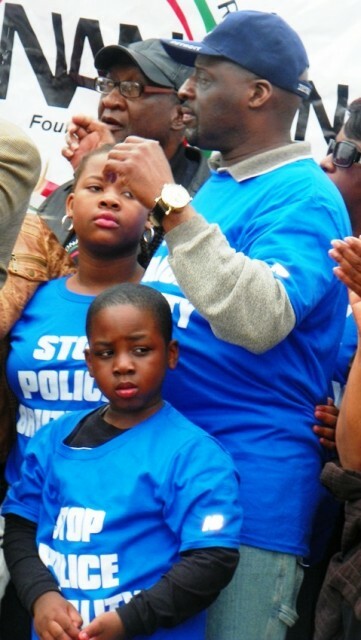 Floyd Dent at rally in Inkster April 2, 2015, with grandchildren. DETROIT – The jury in the felony trial of former Detroit, Highland Park and Inkster cop William ‘Robocop’ Melendez will tour the scenes related to Melendez’ near-fatal beating of Detroit autoworker Floyd Dent on Tues. Nov. 17, by order of Wayne County Circuit Court Judge Vonda R. Evans. A final prosecution rebuttal witness will testify Wed. Nov. 18, after which closing arguments are expected. “It will be an aid for the jury to visit that scene, and we’re going to drive that area,” Judge Evans said. She later ordered a van for the trip. National and international news outlets are covering the trial, including Reuters, the Associated Press, the Guardian, and Al Jazeera America. The video of Dent’s beating went viral across the globe, sparking four major protests in Inkster, Highland Park and Detroit. Judge Evans said she hoped the tour will clarify differing prosecution and defense accounts of the case. Melendez was fired after the beating, and faces 10-25 years in prison if convicted on counts of assault with intent to do great bodily harm, strangulation, and misconduct. Evans’ order, issued after defense attorney James Thomas rested his case without calling Melendez to the stand, capped a week of testimony from prosecution and defense witnesses. During the week, David Lee, Melendez’ attorney in a 2004 federal court case in which he was accused of running an LA Ramparts-style ring of brutal cops, attended the proceedings. Jennifer Wilson (l), supervisor at MSP lab, testifies definitively on cross exam that there was NO COCAINE in blood samples taken from Floyd Dent. Defense attorney James Thomas is at upper right; MSP First. Lt. Twana Powell at lower right. “The video is hard to watch.” Former Inkster police chief Vicki Yost’s assertion that she saw nothing in the dashcam video of the incident to justify the 16 blows Melendez delivered with his fist to Dent’s head. Her assertion contradicted later testimony from a Lake Superior State University criminology professor that the use of force was justified. “I don’t testify for either side, I just testify to the results.” Michigan State Police lab supervisor Jennifer Wilson’s detailed testimony that blood samples taken from Dent at Garden City Hospital tested negative for cocaine and its metabolites (break-down products) on both initial and confirmatory tests. An initial hospital report showed that an initial urine sample from tested positive for cocaine, but no confirmatory test was done. “Dent would had to have taken cocaine 30 hours before the incident for it not to show up in his blood.” Medical Examiner Carl Schmidt, as an expert in toxicology, backed up Wilson’s testimony and countered Thomas’ assertion that the cocaine could have metabolized out of Dent’s system before the blood test. 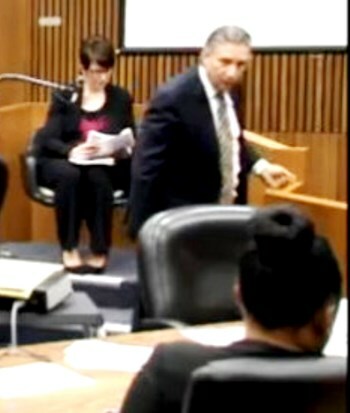 “No latent prints left on baggie.” Michigan State Police First Lt. Twana Powell testified that fingerprint testing had not been ordered on the baggie containing cocaine which Melendez claimed came from Dent’s car, but which Melendez is seen on video pulling from his pocket. She said it was ordered later upon her intervention into the case March 23, and by that time was inconclusive. “I did follow-up investigations to find out which story most likely occurred, Dent’s or Zielenewski’s. . . First time Dent’s car is seen on the video is on Oakland.” Powell contradicted Melendez’ police report and sworn testimony from his partner John Zielenewski regarding Dent’s route. Zielenewski testified they were surveilling the “high-crime” area of Michigan Avenue in Inkster from the parking lot of a motel on the south side of Michigan. He said they first saw Dent in the parking lot of the Budget Inn across Michigan, which they portrayed as a hotbed of narcotics trafficking. Powell said Zielenewski’s view of the Budget Inn parking lot was blocked by a wall. She testified that the first time Dent’s car is seen on the dashcam video is on Oakland Avenue, travelling west. 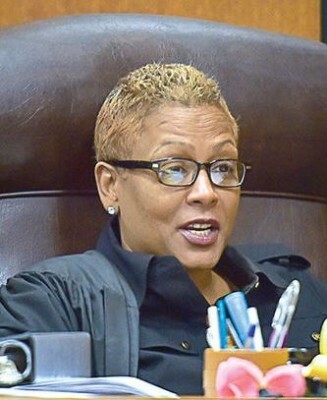 She said Inkster police records showed only one narcotics-related call to the Budget Inn in the year previous to Dent’s beating, on Jan. 28, 2015. Map shows Dent’s route from Michigan Ave. up Fairbairn to Pineridge Park Apts. Old Inkster Police Dept., where beating took place, is at far left. Dent testified earlier that he had never been to the Budget Inn. He said that on the evening of Jan. 28, he traveled from a liquor store near I-275 and Michigan Avenue to the Parkridge Park Apartments to deliver liquor to a friend, Amy Williams, at her request. The Budget Inn is approximately a half-mile east of the Parkridge Park Apartments and Fairbairne Street, which Dent took to Oakland, where the apartments are located. Powell testified that Dent’s cell phone records confirmed his account, showing cell tower pings from the locations he described. Map shows Budget Inn on Michigan, west of Fairbairn, where Dent turned. Dent, who lives in Detroit, has worked for Ford Motor Company for 36 years. There are two Ford plants near I-275 and Telegraph. Map shows route from I-275 and Michigan to Fairbairn Street. First Lt. Twana Powell said cell phone tower “pings” from Dent’s phone confirmed these routes. Williams, a state-paid home health care worker, testified in support of Dent’s account of his brief visit to the apartment complex’s parking lot. She said that that Dent wiped down the interior door well of his late model light tan Cadillac after delivering the liquor to her in the parking lot, telling her he had just had the car washed. Pineridge Park Apts. on Oakland, Dent’s destination. Dent testified earlier that he opened his door during the traffic stop instead of rolling down his window because he didn’t want to streak the windows. Defense witnesses asserted that was an aggressive move indicative of imminent danger to the cops. Dent was traveling on a suspended license, with one warrant out for his arrest, Powell testified. She said he had been stopped seven times during the previous ten years for driving without a license. At the conclusion of the prosecution’s case, Judge Evans denied a defense motion for a directed verdict. 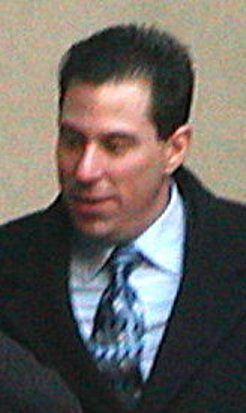 Thomas claimed testimony showed that Melendez had Dent in a “head lock” to immobilize him, not a “choke hold” to cause strangulation. He claimed Dent’s medical records showed no “significant injuries.” He said there was no “subarachnoid hemorrhage” in Dent’s brain, that his nose was not broken, and that the injury to his eye orbit was repaired. The prosecution’s rebuttal witness Nov. 18 is expected to be the Parkridge Park Apartments manager, who will testify to records of the card swipes needed to enter and exit the complex on the night of Jan. 28. This entry was posted in Uncategorized and tagged AiyanaJones, Beatbackthebullies, blacklivesmatter, blacklivesmatterDetroit, FloydDent, JailKillerCops, PoliceState, policeviolence, PrisonNation, RobocopMelendez, saveourchildren, StandUpNow, StoowaronBlackAmerica, StopPoliceBrutality, StopPoliceMurders, WilliamMelendez. Bookmark the permalink.